The Global Volcanism Program has no activity reports for Hiuchigatake. The Global Volcanism Program has no Weekly Reports available for Hiuchigatake. The Global Volcanism Program has no Bulletin Reports available for Hiuchigatake. Hiuchigatake volcano lies in Nikko National Park and erupted the 8 km3 Hiuchigatake-Nanairi tephra and pyroclastic flow deposit about 170,00-160,000 years ago. Two lava domes at the southern end of the summit overlook Ozenuma lake, a popular hiking destination in the national park. The southern of the two domes, Akanagure, produced a series of viscous lava flows about 3500 years ago that extend to the S and W flanks. The northern dome, Miike, was the source of a tephra layer correlated with a report of historical activity in 1544 (Hayakawa, 1994b). Hayakawa Y, 1994. Discovery of an eruption product of ca. 500 years ago at Hiuchigatake. Bull Volc Soc Japan (Kazan), 39: 243-246 (in Japanese). There is no Deformation History data available for Hiuchigatake. There is no Emissions History data available for Hiuchigatake. 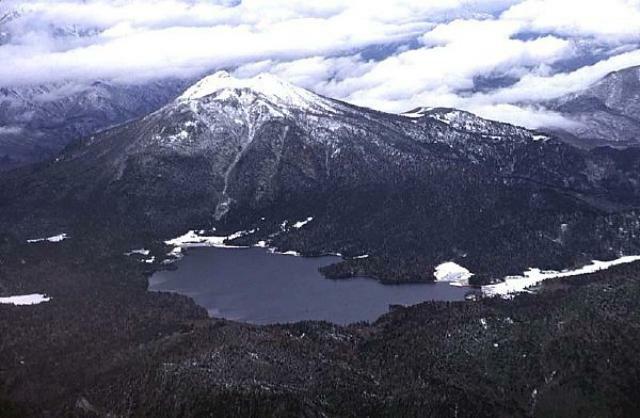 Snow-capped Hiuchi volcano rises above Ozenuma lake, a popular hiking destination in Nikko National Park, in this aerial view from the SE. Two lava domes at the southern end of the summit of Hiuchi stratovolcano have been active during the Holocene. The northern dome produced viscous lava flows about 3500 years ago, and the southern dome was the source of an explosive eruption in 1544 CE. Copyrighted photo by Shun Nakano, 1996 (Japanese Quaternary Volcanoes database, RIODB, http://riodb02.ibase.aist.go.jp/strata/VOL_JP/EN/index.htm and Geol Surv Japan, AIST, http://www.gsj.jp/). There are no samples for Hiuchigatake in the Smithsonian's NMNH Department of Mineral Sciences Rock and Ore collection. Large Eruptions of Hiuchigatake Information about large Quaternary eruptions (VEI >= 4) is cataloged in the Large Magnitude Explosive Volcanic Eruptions (LaMEVE) database of the Volcano Global Risk Identification and Analysis Project (VOGRIPA).